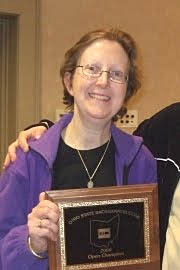 All U.S. tournament players have known of Mary Hickey's excellent backgammon skills for many years, but her recent win of the U.S. Open, coupled with several other wins and high finishes in the past few years has catapulted her ranking and has clearly established her as one of the better players in the game. Even before the US Open win, in the recent Giants of Backgammon voting, Mary was recognized as being in the top 64 players in the world. Once you read this interview with Mary, you will recognize that it is no fluke she plays well. I learned the game in 1977 or 1978, on a business trip to Texas. I then slowly became more involved with the game, but attended only one big tournament "back in the day" (in Las Vegas in 1980) because it was too difficult to get away. First there was my work as a chemical engineer, then I had children at home making travel a no-go. I gave the game up entirely for many years, then restarted playing once or twice a month at the end of 1995. I gradually added more tournaments to my schedule, and plan to play five or six a year from now on. It has to have been the 2010 US Open, because of the tournament itself including my come-from-behind win in the final, but also the circumstances. I won the only online qualifier that Play65 held, then won the event itselfquite an improbable parlay! I don't want to see any changes that meddle with the integrity of the game itself. The Jacoby Rule and the Crawford Rule can affect what play should be made, but their only direct effect is on scoring, not the game itself. Similarly, differing tournament formats don't change the underlying structure of the game. Everyone lets out an occasional rude expression when they roll their only root number, or if the game they were winning a moment ago deteriorates in one sequence to the point where they have to pass a recube. But there is no need or excuse for endless potty-mouthed or blasphemous commentary throughout a chouette or match. If the first thing an observer hears as they walk by the playing room is someone loudly berating the dice and/or their opponent (or just the fact that they were born) in terms that longshoremen would find objectionable, how likely are they to take up the game or encourage their family to do so? Clean it up, already! I would say: The first thing you must do is learn the basicsthe game's rules and common terminology. I would recommend you start with a good beginner book such as the venerable Jacoby and Crawford, or the equivalent in online resources, followed by Magriel's Backgammon. You will then be ready to play online at whatever server is compatible with your temperament, and perhaps join a local club and play in its tournaments. At this point you also need to install a friendly "bot" on your computer to assist you by analyzing the positions, games and matches you feed it. You can also play against it if you find that a helpful way to learn. It is all right to begin playing regularly before learning a great deal about the game, but don't do it enough to form bad habits that you will have to unlearn later. It's so much easier if you get it more or less right the first time! As you progress, you will want to read more books, perhaps take lessons, study a lot of your own matches, and fill in the gaps you discover in your knowledge. You may decide to create a personal library of positions classified in ways that help you study and review, or perhaps even write articles to share with others in the community. With all that said, do not let your world narrow to the point where backgammon, or games in general, take on such importance that they are no longer fun. If that happens, the game becomes work rather than play. If it had an avatar, it would be a taskmaster rather than an entertainer. Yes, learn what you can and develop your skill, but think hard before you give up any of your other interests to make extra room for backgammon or any other game. Be sure backgammon is what you want to do, not something you feel compelled to do. I review what I already know rather than study new material in the week leading up to a tournament. I find it takes time for me to absorb and integrate new information, so it's better to learn new things a month or more in advance of when they'll be needed. I also try to keep my pre-tourney review quite general rather than focus in on specifics, so that I won't overemphasize those specifics when playing and miss other concepts that apply better to the actual positions and games. When I analyze matches I have played, I look not only at my errors but also plays I got right but had a hard time figuring out. If I made the right play over the board, but it was by at best an educated guess, I admit this at least to myself and try to figure out what principle is hiding in the position that I missed. I also explore what my opponents did both right and wrong. My ratio of study, teaching and writing time to playing time is probably "one of the highest in the industry", as they might say in the business pages. But I don't feel this high a ratio is necessary or desirable for all players. My guess is that most serious players settle into a range of somewhere between 1:3 and 3:1 hours of study to hours of play. What I would advise others is to work out what ratio is right for you, and don't consistently skimp on study. These past two years you have had your best results in ABT events. Why? Are you playing better? Getting better dice? Playing more? One big factor is simply that as you note, I have been playing more events. I think another factor in my better results is that clocks have benefited me, since I find the time controls normally used to be more than adequate, but not all my opponents have adapted as well to this change. I do believe my playing is better than before, but not enough to explain the disparity of my results in any given bad year from the past compared to one of the last two or three good years. I'd have to say that part of the story is that in the more recent years, my "luck rate" has also improved, and the dice have come through for me at critical times. There is a lot of randomness in what seem to be the patterns of the game, more than people tend to think. And if we play enough, we are all occasionally going to string together a long enough succession of match wins to be handed a trophy at the end. If it happens early in a player's career, we call it "beginner's luck", and if it happens later, we say they have improved, and use it as evidence that study pays off. And so it does, but not to the extreme and immediate extent that it sometimes appears. As the fund managers say in the fine print below their pitch for your tax-deferred savings, "Past performance is not a guarantee of future results." My win in the US Open was only two weeks ago, but I am already back to studying. Where do you see yourself in 10 years from now relative to Backgammon? I expect to have another couple of books out, including one I am currently writing with Marty Storer as co-author. I hope to continue teaching and playing, but not at the expense of letting the game crowd out the rest of my life. Some form of Parkinson's Law seems to apply to backgammonit easily expands to fill as much of your time and life as you give it. Doubles is by far my favorite side event. When you have a partnership that truly works, your team is better than the sum of its parts. You fill in the gaps and patch the holes in each other's game, leading to lower error rates, which also leads to more wins because many of the other teams don't have this synergy. What do you think is needed to see the game grow in the U.S.? Television coverage would help, I think. The technology is improving, as we saw this year as matches were transmitted in real time to watchers around the world, along with ongoing analysis by the bots and a chat area for the spectators. It isn't a big jump to add voice commentary, and an additional high-quality feed showing the players themselves. You could then include interviews afterward with the players, the whole nine yards of what is already done with sports and with poker. I know you (Phil) are interested in getting kids playing, but I don't think of backgammon as a game truly suited to most children's worldview. They need to learn the basics of pure cause and effect, the point-to-point progress of math and science, plus understand purely stochastic processes such dice distributions and computer generation of random numbers, before they can effectively learn processes that contain a mix of these dynamics. Among those are business and investing, life decisions influenced to varying extent by factors beyond one's control, and of course backgammon. By college age, though, I like to think most kids are ready to understand such processes. If they learn backgammon then, they will be capable of making rapid progress with it, and will also benefit in other areas of their life from the thought process they cultivate as they learn the game. I picture the universe and what lies beyond it as a series of Venn diagrams, each bubble enclosed within a larger one, extending from what we know to what we don't know but could learn now, to what the human race is capable of learning and may learn in the future, and finally up to larger realms we cannot reach with our senses and reasoning powers. That is where faith is needed, to make the jump by means of revelation to some understanding of dimensions that lie beyond our reach. These dimensions encompass but do not negate the knowledge and understanding contained in the smaller spheres, including science, mathematics and the humanities, that they extend beyond. I find that revelation in the Bible and my own particular Christian worldview, but I don't claim my interpretation of Scripture (or anyone else's) is the one and only correct one, nor do I believe any particular tradition has "the nuts" regarding the Infinite and the Eternal that we call God. And we should not be fighting over these things, any more than we should go to war over what is the right way to play an opening 4-3 at a score of 7-away, 6-away. If we all fell into a time warp and ended up 500 years in the future, we all would come to believe differently than we do now about many things. We would then have the benefit of all the insights already available to us, plus 500 more years' worth of building on that knowledge. And the thoughts of men are widen'd with the process of the suns." Most of my backgammon time is spent writing articles, working on the next book, giving lessons, or studying. I try to get to a tourney somewhere in Ohio (Akron, Dayton, or Cincinnati) once a month. I play online maybe two or three times a week on average, for lengths of time that vary from getting knocked out of a DMP tourney in the first round, to long sessions with opponents who want to keep playing awhile. You can find me at Play65 from time to time, and I also play in the Tandem league at Safe Harbor Games when it's in season. Maybe once a week I still play at Gridgammon or FIBS. I played online much more often back when it was new to me. You recently came out with a new CD. Tell us about it and where do we get it? My book on CD, Chouette and More: The World's First and Only Backgammon Sci-fi Soap Opera, is now available at the GammonVillage store and at Carol Joy Cole's Backgammon Boutique. 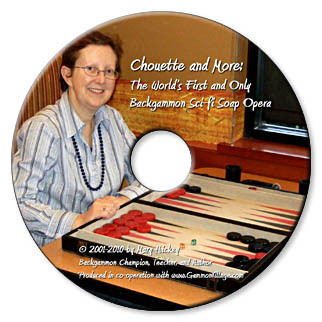 It is a compilation of my 44-column series on chouette, but also backgammon in general, published at GammonVillage, plus three essays I wrote about the qualities of a winner, the benefits of backgammon, and its psychological traps. To read this book on CD, you need a computer but don't have to be connected to the Internet. The chapters appear as Web pages, so unlike other books, it has diagrams in full color and in the later chapters where I used Snowie, the results are complete rather than summarized. It opens automatically when you put it in your CD/DVD drive, and you just click on the option to go to the Welcome Page, click from there to the contents, then click the link to whatever chapter you want to read. It also has Forward and Previous links at the beginning and end of each chapter. In the first few chapters of the book, I present some basic principles for chouette, and then in Chapter 11 the soap opera part begins, with you as part of the ongoing story. Sometimes you play with millionaires in the mansion of a cast-off heir of an industrial robber baron, and other times at a coffee shop where quite a few of the players are fish. You visit the scary slum where an ever-nameless good player lives because he's trying to make a living from the game, with the usual result. Another time, you get set up to play against a fearsome Dane named Lars Balrog. For a couple of chapters, you deal with an obnoxious accountant everyone hates to lose toso much that they sabotage themselves, and proceed to lose to him all the time! The "sci-fi" part of the story happens when you fall into a time warp back to the 1970s, and play backgammon there knowing what you know about the game today. I understand you give backgammon lessons. How long have you been giving them and what makes you a good teacher? I have been teaching the game for a few years now. My instruction is highly individualized, since no two students are alike in where they are with the game, their goals, and their learning style. It helps that I also have teaching experience outside the game, including remedial reading for middle school, art and art appreciation for elementary grades, and computer science for kindergarten. I know you (Phil) have also been teaching the game for many years, but I don't see you as a competitor. I recommend my students check out your "problem of the day" if they enjoy doing so and feel it helps them. If the added hits they produce someday lead to more ad revenue for your site, so much the better. I play other games well enough to enjoy them socially, but I don't excel at any of them. My main interest outside of backgammon is writing. Paulist Press published my book about Mary, the mother of Jesus in 1999, and I've also published numerous devotional articles, short stories, literary fiction, personal experience, children's stories, and humor items. I used to sell cartoon captions to cartoonists, including the late Goddard Sherman. I would like someday also to write music. Though I have drifted from one profession to another many times, I think of myself as first of all a writer and editorial consultant. My degree is in chemical engineering, and I have made a couple of starts toward going back to that profession that didn't work out because it didn't fit in with the rest of my life as it has developed. Some day when our country gets serious about alternative energy and breaking our bond of dependence on imported oil, there may be a shortage of chemical engineers for this work. At such a time I would think hard about going back, but the way it's going I strongly doubt it will happen in my lifetime. Where are you living now, and what are your future plans? I live in Ohio now, and know better than to make any plans! There have always been very few women in backgammon playing at the highest levels of the game. Why? I used to get annoyed when people would make a big deal about my being a woman player, rather than just seeing us all in this together, but now I recognize this is a legitimate question and agree people should ask it. I do think it's good for the game that women are winning titles, not just reaching the semifinals occasionally, or participating but somehow always losing out in the early rounds. Women have always won titles some of the time, of courselook at the World Championship, won by women twice in current memory. (Lee Genud and Katie Scalamandre are the ones I mean.) But how many local clubs ever have a female Player of the Year, or very many women players at all? I think Carol Cole and me winning the US Open may encourage more women players to make a bit more effort to improve, and discard cultural baggage that says it will be more difficult and less rewarding for women than for men. And when I talk about cultural issues, I'm not thinking of any country in particular, because even in the supposedly liberal democracies of what we call "the West", there are still many pockets of prejudice against women that perhaps a few more wins and achievements by women in backgammon and elsewhere will help eradicate. I appreciate players that represent the game well and attract other people to our community. This can mean making a good impression for both our game and our nation when playing abroad (John O'Hagan comes to mind), but it can also mean actions as simple as welcoming newcomers to your local club. It can mean patronizing the venue where your local tourney is held by buying your lunch there instead of someplace cheaper on your way over. Even players who never leave home but do play online can be good citizens by answering a newbie's question in the lobby or playing a game with him or her to help them get started. Has your game improved much in the past few years? If so, why? I believe I have become less erratic and do better in the most important matches than I did even just a couple of years ago. I feel I have filled in some of the most important knowledge about the game that I was missing before. If you were given major sponsorship to run a backgammon tournament, tell us about it. Where would it be, what would the format be, and what would you do to make it more interesting and exciting? How much of a sponsorship am I getting? If I have an unlimited budget, I'm going to hold this tournament in the Beijing stadium they built for the 2008 Summer Olympics. I'd provide information to the residents of Beijing well in advance on how to play backgammon, and where online (within their national firewall) they can learn more about the game, so that we'd get plenty of local talent in the mix of players. Beijing's Olympic stadium has seating for over 80,000 people, not counting the players who will be on the field, so no matter how many show up to play, we're good. The empty stadium draws thousands of visitors who pay an admission charge just to see it even when no event is going on, so it doesn't seem unreasonable to think some of the city residents who have learned the game, will come to play in a backgammon tournament there, or at least watch it. I'd give special prizes to the local players who went the furthest in each division, and also hand out plenty of door prizes and free souvenirs in order to increase the equity for participation. I would also subsidize travel expenses for the foreign players, and try to get some money added to the prize fund by companies in China.